The Hero Initiative: Hero Comics 2011 Hits at San Diego; then July 27! Hero Comics 2011 Hits at San Diego; then July 27! The book, she is at the printer! Hero Comics 2011, the labor of lots of love and some gristle that IDW Publishing's Scott Dunbier has spent way, way, way too many unpaid hours shepherding, is finally ready to spring fill-born ’pon an unsuspecting populace. • And Sam Kieth tells his "behind the scenes" story of working together with Gaiman and Dringenberg again. It's all wrapped in your choice of a killer J. Scott Campbell cover (above), or Adm Hughes cover (below). And did we mention there's a 1-in-10 black-and-white retailer incentive cover as well? Well, we just did. Our giant, giant, GIANT thanks to IDW, and all the creators who participated to make this a great project. And we'd be VERY remiss if we didn't single out Thomas Cho and Trivision Company, who are printing the book FOR FREE; and Richard Starkings, John Roshell and the Comicraft crew, who lettered and designed the book de nada, and made it look great. Now it's just up to you! Buy a copy! 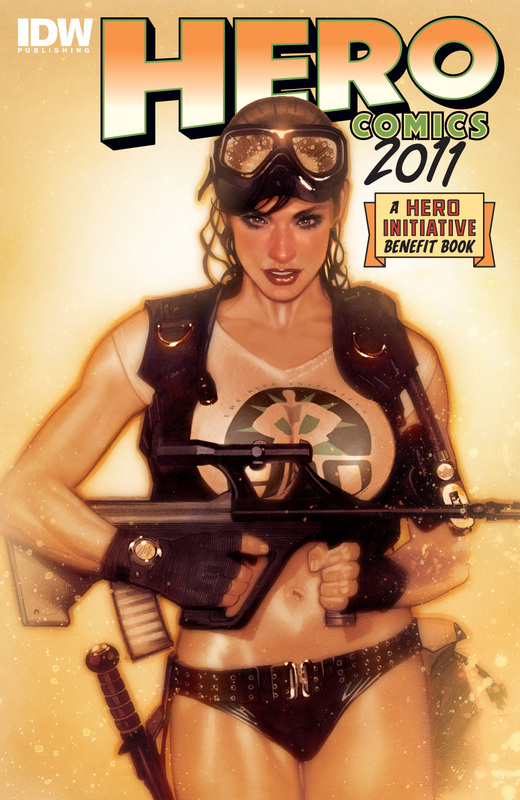 Hero Comics 2011 will be available at the Hero Initiative booth at the San Diego Comic Con July 20, and in stores July 27! Last call coming, 2011 Hero memberships! Take your left turn TO Albuquerque!